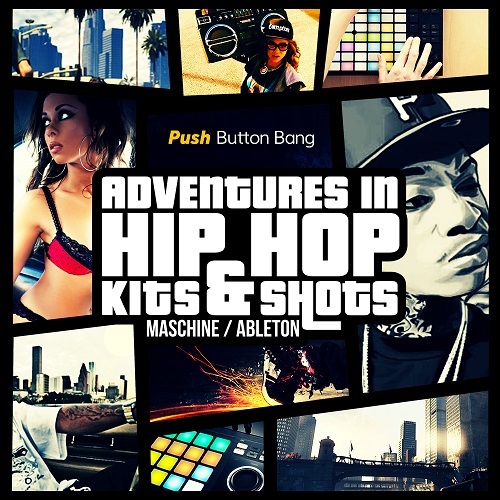 Adventures in Hip Hop takes you on journey through current and classic Hip Hop styles, providing a huge library of inspirational production kits and one shots, specially arranged for Maschine and Ableton. Providing faithful reenactments of original hip hop sounds and unique modern drums and hits, shaped by classic equipment (SP1200, MPC60, Neve Consoles, lo-fi, Tape and Tube Saturation devices), this collection bursts out of the box with over 1900 lovingly produced, fat and crunchy, analogue-style Drum, Instrument and SFX sounds. You will find a simply breathtaking amount of content and ideas, in a range of East and West coast styles, with nods to artists such as flying lotus, jurassic 5, Dre, Kanye West, Black Milk, Slum Village, J Dilla, Danny Brown and more. From big banging kicks and speaker knocking snares, warm sub basses to tight percussion, interesting musical instruments and fx one shots, this unique selection of audio has been expertly divided into hard edged groove kits, each with their own character sound and full one shot library subfolders, for easy sound searching. Also included are over 400 Midi files for use with the kits, to provide multiple patterns for instant beatmaking! Comes packed with over 120 hand crafted kits, 400 midi files plus a separate one shot library version. The kits have been put together for you to mix and match different samples to build and layer up your sounds, making the most of the maschine ADSR, choke grip and pad link options.. also using the macro options to quickly add or take away the included effects. Includes 118 Specialist Racks, 45 group rack versions, 400 midi files and the separate one shot library version. All racks have in-built AUF-FX, fully assigned macros to control specific instrument envelopes in real time, enabling you to add exceptional musical control to each kit. This raw, speaker shaking sound collection is guaranteed to prove essential in both your studio production and live performances and inspire your adventures in hip hop for years to come!